When Cathy asked me to participate on this panel, I was interested to think about drawing not as a self-absorbed act indifferent to world, but as a journey performing self-world relations. The figure that emerged from these ruminations was the map, or rather, the counter-map – a détournement from expected readings. But I shall begin with an historical anecdote. So what, you may ask, has this to do with drawing? I am interpreting the exhibition’s linkage of drawing, dance and performance as a discourse on how we map, or are mapped in, social space-time. Indeed, one catalogue essay to the exhibition describes Terry Winters and Merce Cunningham’s performance Loose Time, 2002, as ‘mapping territory by the bodies of the dancers’; broadly speaking, this seems to concern line and point as shifting between freedom and enclosure. But the Nez Perce story highlights more than this: a tension between our embodied relations to the world and disembodied technologies as tools of power. And I would suggest that what is at stake here are issues of truth and ethics as they are realised on the intersubjective plane. Aside from being drawings, maps were amongst the first disembodied technologies. Visualising the world from some totalising ‘god’s eye’ view is an informational tool of power for control of territory, trade and military advantage. So I shall introduce two mediaeval maps. The first is the Tabula Rogeriana-Rudjdjar, commissioned by Roger, the Norman King of Sicily, in 1154 from the Arab geographer Muhammad al-Adrisi. This is a map of the then known world (no Americas or Australia) charting towns and natural topography, from the Northern (British) Isles and Iberian Peninsula to China, from the Russian landmass to North Africa and the Indian Ocean. The names are inscribed in Arabic, and Mecca is more or less at the centre, although it is not highlighted. The second map, a century later, is the Psalter Map, Westminster, 1265. Jerusalem is situated at the centre as the emphatic spiritual core of the image. Christ is at the top – the EAST; below are Adam and Eve and the Old Testament world, leading to the Classical World of Greece, Rome and the New Testament. At the bottom, which is the WEST, is Britain showing the French territories claimed by the English King Henry III. To the far right – which is to say, the S0UTH – are illustrations of the Monstrous or Plinian Races: peoples imagined to live beyond the limit of the known ‘civilised’ world. Plinians are characterised by their aberrant body parts: headless (Akephaloi), mouthless (Astomoi), revered feet (Antipodes), and so on, or by unconventional eating habits, notably the Anthropophagi (a mediaeval iconography that was to be superimposed on the peoples of the Americas). The difference between these maps is that al-Adrisi’s is spatial, geographical and commercial – albeit with potential military usage. It visualises the trade route known as the Silk Road extending from Western Europe to China, and it could not have been drawn without collating the practical, physical knowledge of hundreds of travellers: it derives from exchanges and encounters. The second is both spatial and temporal; but it maps an idealised theological and political world. The Nez Perce tragedy also maps two spatiotemporal structures: territorial and telegraphic. The trajectory of the Nez Perce presents a structure bound to the spatiotemporal reality of the experiential body and cultural memory. The people belonged with the landscape and so, unlike the US cavalry, were masters of movement through it. But the story also maps a field of digressions and inventions; it opens onto creative interpretations in response to circumstances. This reality has nothing to do with territorial claims; the human trace of the Indian is respectful: the soft tread of the moccasin, in contrast to the crude imprint of the military boot, or the scarring of Land Art’s motorcycles and earth-moving machines. One can see this distinction in Steven Yazzie’s ‘drawing and driving’ ‘art-cart’ trip across Monument Valley (2007). It describes an ecosystemic relation to world, where body, language, culture and landscape are mutually constituted – which is why we should never forget that enforced dispossession of land (ethnic cleansing) by settler occupation has a profoundly traumatising effect on its indigenous victims. Likewise, the complex knowledge system mapped out in Emily Kam Kngwarray’s ‘dreaming’ paintings. As I understand it, in the Aboriginal worldview, every event leaves a trace in the land, suggesting one should take care in what traces one leaves behind. Turning to the US military in the Nez Perce story, one can picture them stumbling around in the woods with deepening frustration. But they possessed a technology that introduces a different relation of space and time to body and territory. What is important to telegraphy – and contemporary telematics – is the economic efficacy of information and its transmission between sender and receiver; it diminishes the temporality of the line and focuses on the point, or better, target. The Global Positioning System is capable of locating each of us instantly from the ultimate panoptical ‘God’s eye view’. Such technologies dispense with experience, memory and creative choice; and to this extent render information impersonal and its truth-value unverifiable. And they sacrifice ethics – if there is no actual person to response to, then there is no need for the ethical accountability that any face to face encounter demands. So we come to extra-judicial murder by remote control exemplified by unmanned armed aerial drones and their so-called ‘Spot and Shoot’ Playstation consoles whose invisible operators can target unsuspecting victims hundreds of miles away at a click. This is at the extreme end of the technologies by which power produces social space by controlling the movements of people. At the other, are social networking sites used to mobilise and assemble people in real time-space. If maps are mostly concerned with plotting the points of power, they reveal little of the embodied reality ‘on the ground’. Hence my first ‘anti-map’ is Solid Sea 03 – The Road Map (2003), a work by Multiplicity, a collective of artists and architects, which focuses on the Mediterranean basin. To paraphrase Paul Klee, Multiplicity ‘took a line for a drive’. Solid Sea 03 – The Road Map consisted of two journeys by taxis between two latitudes in the West Bank. In one journey a Multiplicity member (with EU ID) was accompanied by a person with Israeli ID, and in the other by a person with Palestinian ID. The former journey took a hassle-free one hour; the latter took more than five hours due to detours around military road-blocks and ‘Israeli-only’ roads, taxi changes, and delays at Israeli checkpoints. Multiplicity maps the territory through the politicised bodies of the drivers, revealing more about daily life in the territory than any abstract map. My second ‘anti-map’ is Francis Alÿs’s The Loop, 1997: an aerial paseo round the Pacific Rim from Tijuana to San Diego – a journey of 29 days – to avoid crossing the US-Mexican border. As with other paseos by Alÿs, the depicted journey alludes to a political situation; in this case, US border controls designed to prevent the movement of Latin American drug traffickers and economic migrants. Bear in mind that the border describes a line that both separates and unites two sides in an inexorable relation that often invites transgression. My third ‘anti-map’ is by Grupo de Arte Callejero based in Buenos Aires. Aqui viven genocidos, 2001-02, was a publicly distributed map and video of the home addresses of officials who were responsible for torture and disappearances under Argentina’s military dictatorship, but who had never been prosecuted for these crimes: a détournement from conventional map information and used as a weapon against power. My final ‘anti-map’ is quite different. Mlle Madeleine de Scudery’s imaginary Carte du pays de tendre, 1654, plots an emotional geography and was designed to instruct on the delights of and pitfalls in love relationships. The traveller, starting from Nouvelle Amitié, can plunge incautiously downriver to La Mer Dangereuse; or take meandering routes overland through villages named Sincerity, Respect, Obedience, and so on. These human corporeal, inter-subjective, call-and-response qualities are missing from the logic of telematics. In conclusion, if telegraphy and telematics eliminate biological time-space in favour of the abstract speed of transmission between points of origin and reception, drawing and its extensions map the territory or interval between. At the same time, drawing expresses embodied movement open to diversions, inventions, multiplicity, chance encounters and unforeseen connections with the potential to interfere in the transmission of the message from producer to consumer. If drawing has a social role, it is in illuminating how we are mapped within increasingly repressive systems of control, and how we might imagine mapping ourselves and others more equitably and ethically. 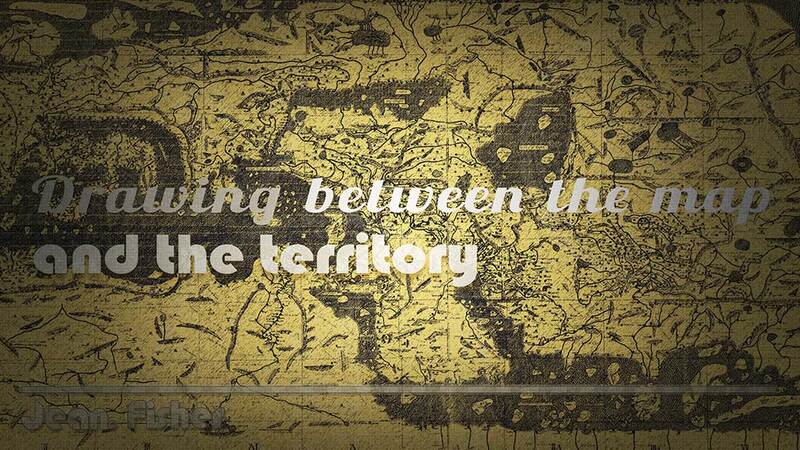 It plays in the differential between territory and map. Presentation to the panel in association with the exhibition ‘Crossing the Line: Drawing and Its Extension’, curated by Catherine de Zegher, MoMA, New York, January 21st 2011.